Widow Juliann Ashcraft, whose husband was one of the 19 firefighters who died in the Yarnell Hill fire, says the city of Prescott is turning its back on the families of the fallen. Those firefighters classified as "temporary" employees do not get full benefits or qualify for a significant family pay-out if they die in the line of duty. NBC's Miguel Almaguer reports. Families of some of the 19 members of the elite Hotshot crew killed fighting an Arizona wildfire in June claim they're missing out on millions of dollars in benefits they think they deserve. Since their deaths in the June 30 Yarnell Hill Fire, a political fight has emerged over a system of compensation for survivors in which benefits for next-of-kin will depend on whether a firefighter was considered a full-time or seasonal employee. According to a report in Arizona's Daily Courier newspaper on Thursday, Arizona House Speaker Andy Tobin is drafting bills to close that loophole, ensuring the families of all 19 firefighters will receive full-time employee benefits. NBC News reported last month that the survivors of the dead firefighters are likely receive a half-million dollars or more in government benefits and private donations. Under the U.S. Justice Department's Public Safety Officers' Benefits Programs for law enforcement and fire officers injured or killed in the line of duty, each family is eligible for a lump sum payment set by law — which is $328,612.73 this year. Charitable contributions and union programs will add tens of thousands more to that total. But 13 of the 19 firefighters were classified as seasonal or part-time employees of the Granite Mountain Interagency Hotshot Crew, based in Prescott. That means their families aren't eligible for lifetime monthly survivor benefits, life insurance and health insurance that the families of the six full-time firefighters will get — benefits that could run into several hundred thousand dollars for each of them. The family of Andrew Ashcraft, 29, one of the part-time firefighters, is leading the campaign. Ashcraft's mother, Deborah Pfingston, has said city officials promised to reclassify the seasonal workers as full-time employees so their families could get full benefits, which city officials strenuously deny. At a news conference Wednesday in Prescott, Ashcraft's widow, Juliann — now a single mom to two young children — promised that she would "do anything I can for the 13 men who are classified as seasonal, because they had lives and families, and they gave the ultimate sacrifice for our community, and they're not being treated fairly." In an interview with NBC station KPNX of Phoenix, Ashcraft, who has hired an attorney and said this week she may file a lawsuit, said Prescott officials had shown no interest in listening to the families. "They have been unprofessional and rude, almost heartless in a sense at times," she said. Prescott officials had scheduled a news conference of their own Wednesday, but they canceled it with the explanation that they'd already said all they had to say on the matter. Which is, in effect, that their hands are tied. "It has been mistakenly suggested that the City made a promise that it would somehow find a way to retroactively reclassify temporary employees as permanent employees so the families can receive additional survivor benefits. The City cannot do this legally; the benefits for programs such as health insurance and the public safety employee pension can only be provided if the individual was enrolled in those programs when the death occurred." The city released some of Ashcraft's employment records to prove that he wasn't a full-time firefighter and had acknowledged in February 2011 that he wasn't eligible for insurance, holidays or "any other benefits not normally granted to temporary employees paid on an hourly basis." Pete Wertheim, a city spokesman, told WSAZ-TV of Phoenix: "We're delivering everything we can to these families that is available. To equalize somebody's employment classification after the event is simply impossible and illegal." But Juliann Ashcraft said that was just an excuse to get around paying the 13 families what society owes them. "They can look at a wife, a widow, the four children of this fallen hero, and they don't even acknowledge the fact that they have any sort of responsibility in being his employer to help us in any way," she told KPNX. "These men were heroes, and all of a sudden it becomes about numbers. It's a numbers game." The 19 firefighters died fighting a massive fire that began June 28 with a lightning strike outside the town of Yarnell, about 50 miles northwest of Phoenix, and rapidly grew into an inferno, the Arizona State Forestry Division said in a report last month. The report didn't address why the interagency Hotshot crew was still on the scene for more than an hour after the winds shifted the fire back toward them June 30. NBC News' Alastair Jamieson contributed to this report. 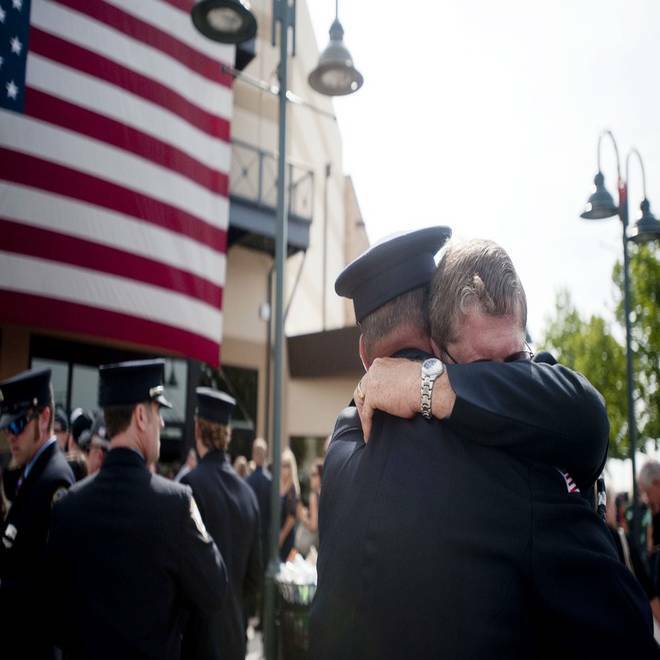 Mayer, Ariz., fire Chaplain Bob Ossler hugs people at a memorial service July 9, in Prescott Valley, Ariz., honoring the 19 firefighters killed in the Yarnell Hill fire.